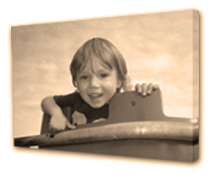 Your photo will be printed in sepia onto canvas and wrapped onto 2cm deep box canvas frame with staple free sides. All of our artwork provided will need you to install picture hooks or screws into your wall to hang your purchase. Price includes all packaging costs and shipping by courier or Royalmail to any UK mainland destination. The artwork will be packed with care to ensure its delivered safely and will be fully insured. For delivery please allow up to 1 week from the date of purchase. For a faster turn around please e-mail us saying when you need the artwork for and we will let you know if thats possible. We take great pride in our work and try to ensure that the artwork you receive from us will be treasured for many years. Please view our feedback section to find out what previous customers have said about our work. Check which size you want and click add to cart. please e-mail or call with your requirements for a quote). MATCHPOPART artwork can be bought as seen or modified to suit your needs.